Funkentelechy Vs. 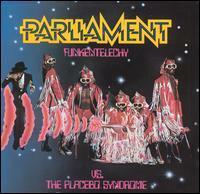 The Placebo Syndrome is a funk album by Parliament, released in 1977. The album is considered to be one of the best in Parliament's catalog. It is a loose concept album warning the listener of falling into the 'Placebo Syndrome', which according to George Clinton is consumerism, and listening to disco music, which he saw as a simplification of funk music in attempt to gain commercial success. The album spawned a number #1 single in "Flash Light", which features a funky synthesizer bass line played by keyboardist Bernie Worrell. The album became Parliament's fourth consecutive gold album and second platinum album. The original vinyl release contained a 22" by 33" inch poster of the character "Sir Nose D'Voidoffunk", as well as an 8 page comic book that explains the concept behind the LP. Both the poster and the comic book were illustrated by Overton Loyd.